Give your hands and feet some much needed love with one of our amazing manicures or pedicures! MOODZ SIGNATURE SPA MANICURE | 35 “Our Signature Hand & Nail Treatment” Our most luxurious hand and nail treatment. 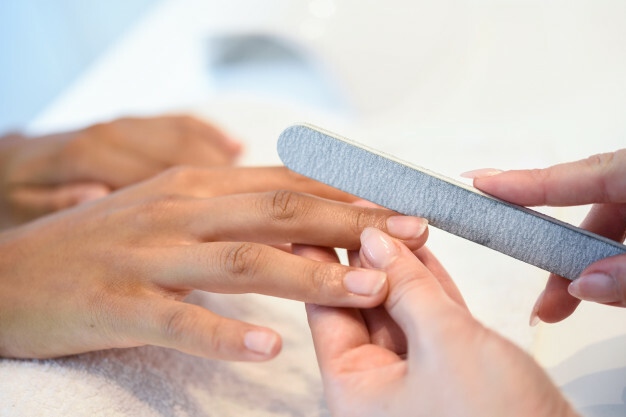 This manicure incorporates added benefits such as greater exfoliation and a special mask with hot towels for incredibly moisturized hands and nails. A nail strengthener is applied before polishing. Your hands have never felt softer. Improve the appearance of your hands with this enzymatic peel. Dark spots are diminished and hands look more youthful in just one treatment. Series of 3-6 is recommended. Step into our state of the art pedicure whirlpool spas - what a treat. Equipped with massage controls, heated adjustable seats, and whirlpool bath, you’ll feel relaxed the minute you dip your feet in! Come experience our secret technique for combating the driest of feet. Your feet will thank you for this one! Our most luxurious foot treatment. In addition to our classic pedicure, you’ll receive a spa scrub, a cuticle revitalizer, a spa mask with hot towels, and an intense foot and leg massage with oils. It’s the foot treatment that’s got it all. Your feet have never felt softer! Pharmaceutical-grade ingredients are used for this highly effective pedicure. Active ingredients are able to penetrate faster and deeper into troubled skin of the feet. With results seen in a mere few days, from eliminating simple dryness to addressing more severe conditions resulting from diabetes and other ailments.